Concise chapters, written by experts in the field, cover a wide spectrum of topics on lipid and membrane formation in microbes (Archaea, Bacteria, eukaryotic microbes).All cells are delimited by a lipid membrane, which provides a crucial boundary in any known form of life. 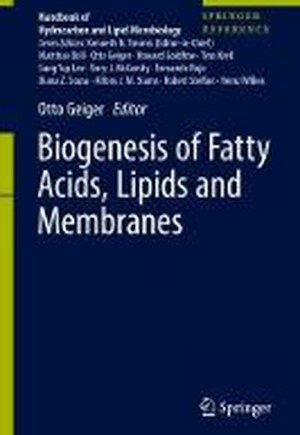 Readers will discover significant chapters on microbial lipid-carrying biomolecules and lipid/membrane-associated structures and processes. AcetylCoA Synthesis and Regulation.- AcetylCoA Synthesis and Role in Bacteria.- Autophagy in Stationary Phase of Growth.- Bacterial Sphingolipids.- Cell-contact-dependent Outer Membrane Exchange in Myxobacteria.- Contributions of Membrane Lipids to Bacterial Cell Homeostasis Upon Osmotic Challenge.- Dynamic Membrane Structure: Function Analysis by Means of Chemical Probes.- Evolution of Hydrophobic Storage Polymers.- Evolution of Lipids.- Evolution of Membranes.- Fatty Acid Synthesis and Regulation.- Fatty Acids: Introduction.- Formation of Bacterial Glycerol-based Membrane Lipids: Pathways, Enzymes, Reactions.- Formation of Fatty Acids.- Formation of Hopanoids.- Formation of Isoprenoids.- Formation of Lipochitin Oligosaccharide Signaling Molecules.- Functional Roles of Individual Membrane Lipids in Bacteria, Archaea and Eukaryotic Microbes.- Functional Roles of Non-membrane Lipids in Bacterial Signaling.- Hopanoids and Membrane Integrity and pH Homeostasis.- Lipid A.- Lipid Chaperones.- Lipid Chaperones and Regulation.- Lipid Intermediates in Bacterial Peptidoglycan Biosynthesis.- Lipid Metabolism in Microalgae.- Lipid Rafts.- Lipid-protein Interactions.- Lipid-protein Interactions Determining Membrane Fluidity in Prokaryotes and Eukaryotes.- Lipids as Receptors.- Lipoteichoic Acid Synthesis and Function in Gram-positive Bacteria.- Membrane Disrupting Proteins.- Membrane Formation and Regulation.- Membrane Homeostasis Upon Nutrient (C, N, P) Limitation.- Membrane Homeostasis upon pH Challenge.- Membrane Lipid Biogenesis.- Membrane Structure:Function Analysis by Means of Chemical Probes.- Membrane Structure:Function Analysis Through Reconstitution In Vitro.- Membrane Vesicles, Nanopods and Nanotubes of Archaea.- Metabolism and Regulation of Glycerolipids in Yeast.- Metabolism and Roles of Sphingolipids in Yeast Saccharamyces cerevisiae.- Modeling Lipid Membranes.- Modeling Lipid Metabolism in Yeast.- Mycolic Acids: Structures, Biosynthesis , and Function.- Nonpolar Lipids in Yeast: Synthesis, Storage and Degradation.- Ornithine Lipids and Other Amino Acid-containing Acyloxyacyl Lipids.- Outer Membrane Extension Nanowires of Bacteria.- Outer Membrane Vesicles of Bacteria.- Phenolic Lipids Synthesized by Type III Polyketide Synthases.- Players in the Nonpolar Lipid Game - Proteins Involved in Nonpolar Lipid Metabolism in Yeast.- Polyhydroxyalkanoate Biogenesis.- Preface: Biogenesis of Fatty Acids, Lipids and Membranes.- Production of Wax Esters by Bacteria.- Protein Lipidation, Elucidation by Chemical Proteomics, and its Functional Roles.- Regulation of Membrane Lipid Homeostasis in Bacteria upon Temperature Change.- Role of Lipid Domains in Bacterial Cell Processes.- Role of Lipids in the Eukaryotic Secretory Pathway.- Role of the BAM Complex in Outer Membrane Assembly.- Structure:Function of Transmembrane Domains of Proteins and Transmembrane Organelles.- Synthesis of AcetylCoA from Carbon Dioxide in Acetogenic Bacteria.- Synthesis of Acetyl-CoA from Carbon Dioxide in Acetogenic Bacteria.- The Biosynthesis and Evolution of Archaeal Membranes and Ether Phospholipids.- Type III Polyketide Synthases Responsible for Phenolic Lipid Synthesis.- Vitamin Formation from Fatty Acid Precursors.- Wax Ester and Triacylglycerol Biosynthesis in Bacteria.